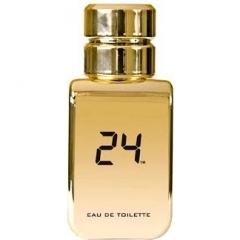 24 Gold is a popular perfume by ScentStory for women and men and was released in 2010. The scent is sweet-gourmand. The longevity is above-average. It is still in production. My opinion on this fragrance is my first Oud fragrance, need to get used on smelling Oud, the scent is a smokey, with a sweetness of the vanilla and mixture of the amber and jasmine and the Oud is there very prominent but not in your face stankey, with a bit a hint medicinal to it. Performance/ Longevity is close of being beastly. It lasted on my skin close to 16+ hrs, presentation/design is a sold 7/10. Overall my rating is a 7.5/10. I need more wear and to get used to the Oud. Don't blind buy should test it first if is in your liking. At first you can perceive a fine rosy note, which brings with it a very subtle smoky hint and is due to the guaiac wood. At the same time, a delicate, sweet, light floral note can be perceived, which melts into a whole with the guaiac wood and I can very well imagine that through the interaction with the jasmine a sweet raspberry can be perceived, but that it disappears completely the closer I smell to my wrist, but I can also be completely wrong and indeed raspberry was used in the head note. Completely in the background and rather only on the skin findable, is a dark, very deep and densely working woody note noticeable, which one can absolutely attribute to the Oud. Additionally I would like to comment on the Sillage right at the beginning, instead of always at the end of my comment as usual. The top note is perceptible on my skin for 20 minutes before the heart note unfolds. A very fine bitter and aromatic sweet note is now perceptible and comes from aniseed. The anise is accompanied by a light spicy and subtle creamy note, which ensures that the fragrance simply appears pleasantly cuddly and comes from the sandalwood. These two notes are enveloped in a soft woody nuance, which gives the fragrance a beautiful accentuated supple hint and is due to the cedar wood. The heart note is perceptible on my skin for 4.5 hours before the base asserts itself. A delicate, smooth, lovely powdery note blends with a beautiful sweet spicy note to a wonderful, light gourmand cuddly aura, which is accompanied by a very delicate sweet flowery nuance and comes from Madagascar - vanilla in combination with amber and ylang - ylang. 24 Gold is a great companion in the autumn and winter months for women and men over 25 who are looking for a sweet, rosy, floral, woody, tart, aromatic, spicy, creamy, floral and gourmand scent to simply wrap themselves in a pleasant cuddly aura. In total the fragrance lasts 9 hours on my skin. I would like to express my sincere thanks to our perfume "Mydarkflower" for the rehearsal. Don't want to lose so many words others have already described the fragrance in detail. Smells for me actually only like penetrating synthetic vanilla, that it becomes only bad of it. You can see the oud a little bit in the background, but you don't notice it because the vanilla has knocked out the oud already in the first round. Durability was not to be expected otherwise very good, would have done well to reduce them a bit. Not only does he share the flacon's design with 1 million but also its perverse dirty sweetness. I respect that this is very unique to me and most people you meet won't have smelled anything like this. It is the longest lasting fragrance I've ever had with monster projection and longevity. But it just doesn't smell good, it's got a weird smell to it that I can't put my finger on. Definitely not mass appealing everyone I asked said they dislike it (12 people). Some said it smells too feminine for a man but doesn't smell like a female fragrance? Confusing and negative reactions so I got rid of it. I got this because of an old Jeremy Fragrance video, but after getting it looked at another video of his and the girls on that disliked it too. So in conclusion I would not recommend this. Too musky and too harsh! I can easily smell the raspberry and the chocolate (and I happen to be a fan of raspberry), but it isn’t as nice as it sounds. I cannot understand all the good reviews. 24 Gold is too musky, and too harsh! Almost makes my eyes want to water. But while I appreciate the fact that it certainly isn’t feminine, I am sure there are better raspberry fragrances out there. I would rather wear something from the Dollar Store than to ever wear 24 Gold again. 24 Gold by ScentStory is one of those fragrances that proves that in this industry, as far as the consumer is concerned... all that matters is the juice inside! In other words "never judge a book by it's cover", and that really sums it all for this one! People thought that "how could a fragrance inspired by a TV show be any good?". Wow! How everyone was pleasantly surprised! Again, this really shows how much we value "brands" and "big names"... I mean if this was put in an exclusive flacon and released by a huge French fashion house (or by someone like Tom Ford) then we would be all over it! But instead it comes from a small company from the middle east and inspired by a TV show! Who would've thought it? Again it just shows you how quick all of us are to judge a book by it's cover! So how does it smell? Well it is primarily an amber based fragrance (and a sweet one at that)! You have a combination between an amber softened by vanilla and musk (and also by the soft & creamy "woody" notes here like sandalwood, guaiac wood and oud - the last one in small quantities). I do actually detect the oud, but it's faint, and it doesn't overpower the fragrance in any way as the main notes of amber and vanilla dominate the scent. Bottom line: This is a perfect scent for so many different occasions! I see it mainly as a cold weather scent, but if you spray very light it could be used for summer nights. It is (well) worth the money, which is very cheap for this level of quality in a fragrance... and it even puts some well established so-called "designers" to shame, by offering a borderline niche scent at half the price of a designer perfume! I would recommend this to people who like sweet amber or vanilla perfumes, with a woody background. It can be used casually, but I think this works best when you are out to "impress" in a formal setting (like a restaurant or high class bar), or an expensive banquet or something. If you can't test, and you like what I have just described, then don't be afraid to buy it. It is a sweet, woody, almost musky smell. Very warm and sensual. Especially good for winter and colder seasons. If you can't try it, buy it! The opening is sickly sweet and I assume this is due to the jasmine note which I guess I'm now not a fan of. I get gaiac with aoud faintly lurking in the background but never taking center stage. Some users have detected a raspberry note, but this wasn't the case for me. It takes about 20 minutes for the cloying to phase out. Not a fan at all in the opening, but hang in there & you will be rewarded in the dry down just as the case with the original A*Men. After 20 minutes the fragrance smooths. It's a sweet woody tone, the aoud must be giving off a faint pulse, as I don't find it earthy or dry at all. Sure enough, like clock work I struck gold at the 90 minute mark.. It develops into a soft creamy gourmand scent. A solid 3-4 hours I'm left with a creamy vanilla custard scent, some cinnamon with a woody undertone. It's sweet, but not a synthetic sugary scent 'Rochas Man' has which tends to be linear. 24 Gold definitely isn't linear, it's more refined & presents a luxurious vibe that is inviting but not dominating like '1 Million' is. The projection up until this point has been very good. 5+hours in, it's approaching the skin scent stage. A gorgeous edible cinnamon scent. This phase lasted for half a day (12 hours) no joke. I Woke up the following day, and I could still smell the trace on my hand, smelt like luxurious bar of soap. Warm, creamy, comforting & inviting in a subtle way. If you enjoy 'Rochas Man', this is hands down the better choice. It's classier & smells more expensive. Although '1 Million' has its own place in the night life environment, this is more ideal for a relaxed environment or occasions. Restaurant/movies/home/bedroom..
A lovely UNISEX fragrance which has an affordable price tag, smooth & creamy dry down which could be mistaken for a niche scent. Take an old rotting wooden log. Set it to dry near a fireplace. Hollow it out, fill with dry dirt, whole vanilla beans, cinnamon bark and warm spices. Hide the log in the throne room of a sultan, let years of frankincense and sweet myrrh suffuse the wood. Heat the log over a fire and spoon some whipped cream on top. Now step back and smell it as a complete scent: this is 24 Gold. It wasn't love at first sniff, however. At first I worried that I'd received a dud batch or perhaps the oud note was not nearly what I expected. But I gave it time, first resigned to a bad blind buy, then cautiously optimistic, then enraptured! Gold is a good name for it, fitting in both hue and value; 24 Gold is one of few fragrances I have considered stocking up on just in case they decide to discontinue it, gold ingots stashed away from prying eyes. It's not as much of a sillage monster on me as some others have described, I would actually prefer it to be stronger. It fares better sprayed on clothing but I enjoy it more when activated by body heat, so there's a trade-off. I do wish the bottle was a little transparent as due to the weight of it and the opaque metallic coating it is difficult to judge the level of perfume inside. On a more personal note, I enjoy washing my hair with my coconut and Marrakesh oil conditioner and then liberally applying 24 Gold. Generally I avoid mixing perfumed products but they mesh together well. It encourages confidence and sensuality... I feel warm and mysterious, a desert priestess making libation. Ok guys, here is my own story, just today 17:10PM with 24 Gold. 15:45 PM - I logged out from work and will head to post office to check on my perfume orders. My male co-worker that is logging out by 16:00pm ask me if I want a lift going home. I said sure then we can meet some place outside office after I checked my p.o. box. Deal! He said. 15:50 PM - I arrived at Post Office, heading to my box then went to the counter to claim. Postman gave me the box, I read the sender, expecting to get the Agent Provocateur or Le Dandy edt &/or edp. But the seller was from Amazon which means, this is 24 Gold. I opened the package, and saw the gold and black classy 24 Gold and checked the authenticity, serial no. etc. It all match, an assurance of authentic purchase. Now my last test would be, to spray it. Gold cap was great, easy and tight at the same time. I tried to spray once, no perfume came out, another, still nothing. Then I am solved that this is the real deal. 15:57 - 1 spray to back hand. Oh sweet first smell, reminded me of Paco Rabanne Ultra Red and 1 Million. Very vanilla, creamy top, a little powdery but very pleasant, could be guaiac wood but definitely no oud, yet. Powerful projection. Three minutes after oud is slowly manifesting, subtle and very pleasing equally combining with jasmine which astonished my nose, making me convinced that this is wonderful indeed. After 10 minutes, its sweetness lessen and oud/floral combo much detected now. Such a beautiful scent that is sensual, well blended, transforming and very oriental but not cloying. 16:10 - The projection outside the post office is outstanding. The cold winds enhanced the fragrance. I was walking to meet my co-worker at the pharmacy, to ride with him and with just a spray on my back hand, the scent is a massive cloak in a winter afternoon. Just amazing to experience it. 16:15 - I hopped in to his car and whoa, he smelled it already and told me what scent was that? It is strong but it smells very good. So I told him the brand and he wants to see the bottle and he smelled the sprayer and said, it is different from how it smells on me, different but very good aroma. He asked me where I bought it coz it is the first time he heard about this perfume. So that was it, my actual experience with 24 Gold that ended with an immediate compliment.